I feel like my whole Caramoan trip opened this side of myself that loves traveling. I have hiked to mountains and got to experience a day in Pampanga and Tagaytay but have never really put much attention into the whole me going places. After that trip I asked myself “where to next, Izza?”. As a newbie wanderer, I am constantly checking Pinterest and other travel blogs for insider tips as I would want to embrace my love for exploration in the coming months. But the SavingsPinay founder, I still want to stay frugal and travel on a budget. I want to enjoy a vacation without ruining my finances. 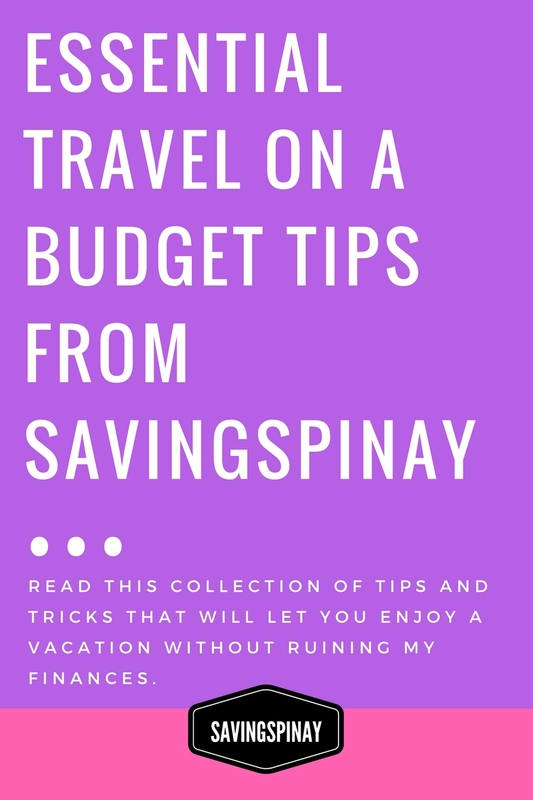 So if you happen to be like me, here are the Essential Travel on a Budget Tips you might want to read before your next adventure begins. My very first tip is to book your next trip in advance. Air fare increases as your planned date for the vacation goes near so if you have already decided on where to go and when to go why not seal the deal by booking your flight online. Try Traveloka. This flight and hotel booking platform offers the most up to date cheap flights and budget-friendly accommodations around Southeast Asia and Asia Pacific. What’s nice too is that they show the final prices already with no booking fee and no hidden costs at all making you avoid unforeseen charges. Note. For extra on-a-budget travel tip do watch out for deals announced and published by airlines. You can follow on social media or become part of their mailing list to be automatically updated. It is also better to commute rather than rent a private van to get around the area. Taking the public mode of transportation will help you grasp the city well and explore better with your senses. There are hidden places, restaurants and other treasure escapade you might unleash as you either walk or follow the usual transport. Just be mindful of your belongings and as much as possible take a city map with you or have apps on your phone that can help you navigate safer. Next to finding cheap flights is making sure you also save on booking hotel and accommodations. Where you stay on your vacation has deep impact on how enjoyable and fun your trip will be. Not to mention you and your family or friends safety. Below are the common deciding factors when choosing a place to stay. 1. Location. It should be in the center of where your itineraries are. Glad that most hotel booking sites nowadays has a View Map functionality so you can see how near or far your hotel is to the landmarks and activities you want to do. Also take note of its proximity to public transit. During my Pampanga trip with my eldest sister we were able to book a hotel at downtown proper situated right in the middle of where we will watch the Philippine Hot Air Balloon Festival and visit other attractions. We were able to save ton of money because of it. This was a complete opposite of what happened on my Tagaytay trip with my bestfriend Nica where in the hotel we booked was too far from the places in our itinerary. In the end we spent more time, money and effort going back and forth rather than exploring. 2. Price. Personally I don’t like too expensive hotels especially if I will be on the road most the time. It is important to check the pictures on site especially the interior and see how clean and comfortable the place is. Make sure to compare prices from the main website of the hotel to the booking website of your choice for promos and discount codes you can use. 3. Facilities and Amenities. Basic amenities like free WiFi, parking, restroom, pool etc. should and must be available to make your stay more relaxed and free from stress. 4. Rating and Review. It is best to hear from others who have experienced what its like staying in the hotel you are eyeing. Read the online reviews and find out more information about the hotel. You will then know what to expect the day you booked your accommodation from how friendly the staffs are to whether the WiFi really works etc. Choosing the right hotel shouldn’t be a daunting task. Just ask what’s important for you. Is is the location? Your budget? The facilities and amenities available? Or reviews from others? Or consider all of the above once your budget hotel selection process starts. Consider the fixed-cost trips you see mostly on your newsfeed if you want to travel on a budget. They are mostly inclusive of the transportation, accommodation, tours, meals and other costs you’ll have if you do it your own. There are also resort packages being released and can be a good alternative for you not to think too much on where to stay and what to do during your vacation. Group Tours are highly considerable since I’ve mentioned in my Ultimate Guide to Caramoan Island Hopping that the more person you are on a trip the less costly it can be. Thanks to technology, staying in touch to your loved ones is now cheaper and easier. Big telecomm industries offer a huge promos that have call, text and surf functionality. Hotels, hostels, villa etc. have WiFi available in rooms and/or common areas. Most places and restaurants you go to provides free internet access as long as you become a customer. I found that the best and the cheapest way of preserving the memories of your trip is to keep a journal or in my case a blog. It is so satisfying to keep a diary, take photos and recap what happened during the day or night. You can always go back to your entries and reminisce your memorable events and special moments for free. Weekday flights are much cheaper compared to weekends. It is also better to travel off-season if you want to spend less money on air tickets. Check out hotel accommodations and book in advance before going to your destination. This will give you an ample time of preparing your itinerary and budget. Try backpacking inns, hostels, homestays etc. to save money on your accommodation. These type of stay are cheaper compared to hotels plus you can get a chance to really feel the ambiance of the city. Eat like a local. Avoid dining on fast food chains and restaurants. Taste new dishes that locals eat for they are tastier and way cheaper. Create a Budget. I have taught you how to establish a budget for beginners right? Now it is time to create one and follow one accordingly. During my Tagaytay trip I was able to keep track of all our expenses thanks to keeping a budget from day zero to the last day of our journey. Before experiencing Caramoan, I never knew how fun traveling can be. If only I have a ton of money and I don’t need to be present on my job daily then I’ll probably travel to every places on my wishlist. At the moment my goal is to save a lot and find more sources of income so I can fund my travels better. 2016 is only the beginning of my whole travel-while-you-can journey.